Today, I am going to talk about iPhoto '09, excluding the rest of iLife '09 suite. (Garageband, iMovie, iDVD) After Playing around with iPhoto '09 for few days, and I could conclude that this is another big step that Apple has done it again for the users like me. It is much improved version of iPhoto over previous one (iPhoto '08) with things like face recognition, geotagging, and social network integration. It is quite fun to use it, and see how much data now I could manipulate on each photos apart from previously File Name, Photo Name, Date & Time, Camera Type and settings, Events Name, now you could add Face Name, and Geographical Location of that particular photo. The Face Recognition isn't perfect 100% but I could tell you that it made me laugh at some. The System recognised 2 different lady with the same pattern, and in fact, I did agree with it, as I thought both of them look the same. Social Network Integration - and in this case FaceBook and Flickr. Geotagging - is quite wonderful as it is an integration with Google Map, and Camera. At the moment, the only camera which allow GPS location I have would be iPhone 3G. 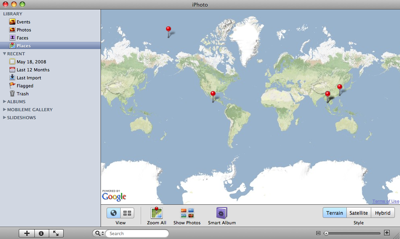 iPhoto '09 would automatically transferred those data into Map (Google Map). If you don't have such camera just simple edit it from the Map view, and enter your own data. For More information Please visit Apple Official website, as it also has Tutorial there, and I always think that Apple Tutorial is one of the simplest instruction on top of easy to use Hardware, and Software. Will try to write more on this if there would be anything interesting but it is simply perfect for me!